The main focus of the OPNsense project is to provide a secure and manageable platform for all your security applications. This means high quality software that is easily maintainable and bug free. We think that having a framework with a clear separation of concerns is essential to achieving these goals. OPNsense is a fork of pfSense ®. The existing code base of pfSense ® does not always apply a clear separation of concerns. This means we need a transition of the old (legacy) code base to a new one with a clear separation. We have chosen a gradual transition to avoid a big bang and keep the product feature rich while increasing code quality. This enables simple addition of new features with less bugs and shorter time to market. This article describes how this will be achieved. 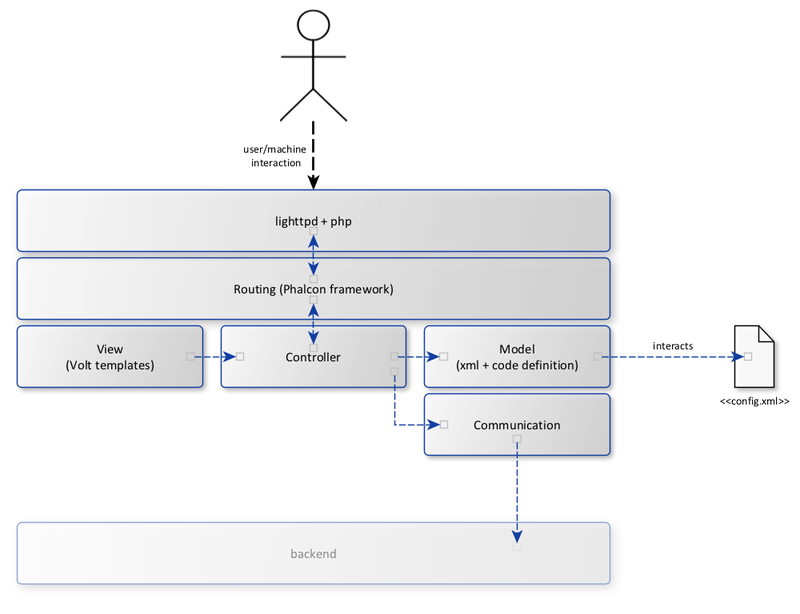 As the above model shows there are two main areas in our stack, the frontend implemented with PHP/Phalcon and the backend using a custom service built in Python. The frontend handles user interaction and communicates with the backend service. 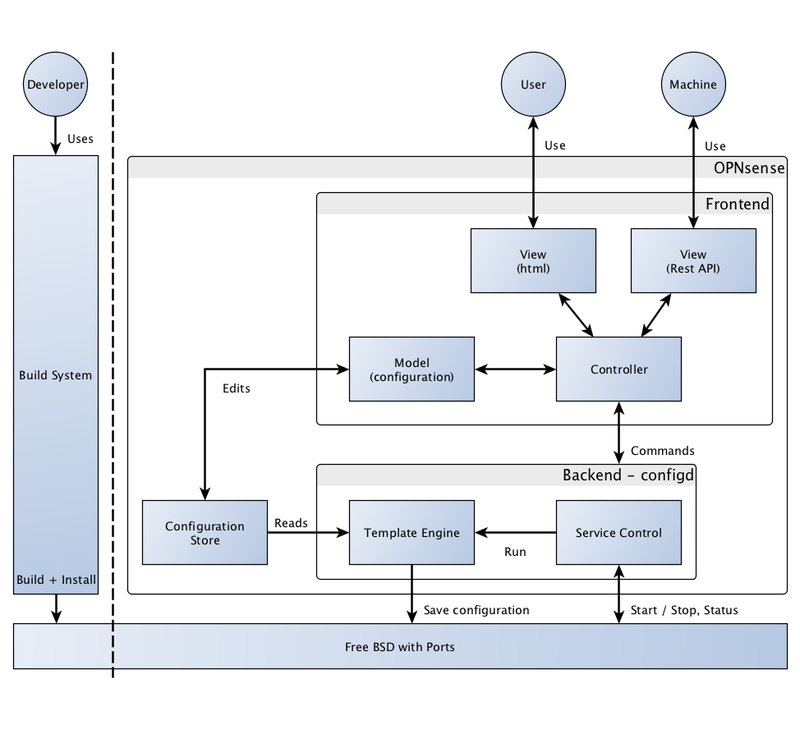 Applying configuration changes, monitoring and controlling services offered by OPNsense is done by the backend service. By using a fully configurable backend service, we avoid hardcoding of services and ease the implementation of new features. The frontend stack delivers a model driven approach to handle configuration data, including automatic validation. Manipulation of the core configuration file is handled at the frontend model; the backend service is merely a consumer of the information provided. 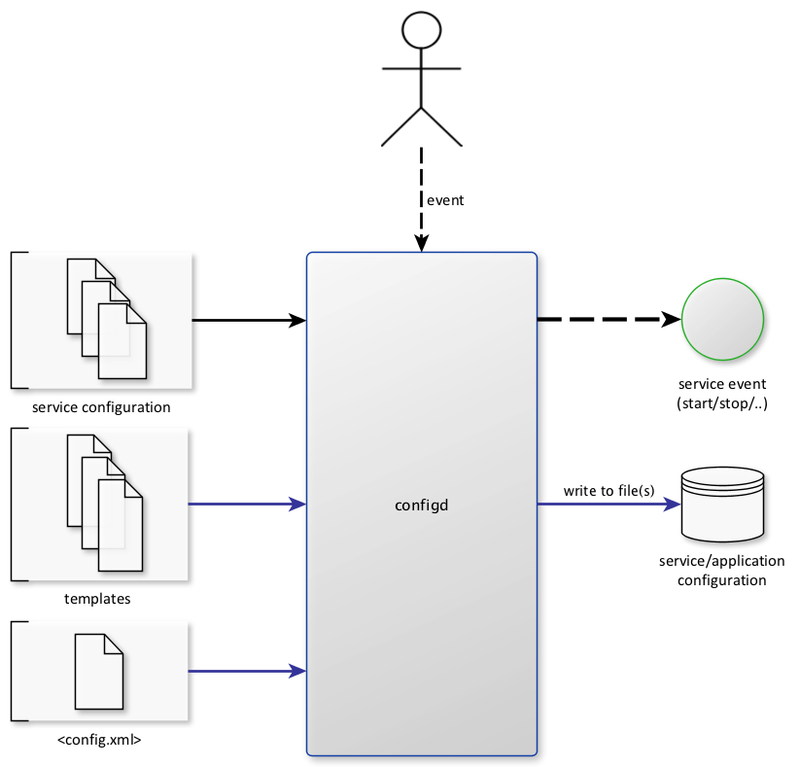 Configd, is responsible for the core system interaction like starting and stopping of daemons and generating configuration files for used services and applications. The daemon listens on a unix domain socket and is capable of executing actions defined in it’s own configuration directory (“/usr/local/opnsense/service/conf/actions_*.conf”). inline : perform inline actions which are part of configd, currently only template generation. Template generation is handled by Jinja2 (http://jinja.pocoo.org/), more information on how to create application templates can be found at Using Templates. The OPNsense framework uses components from Phalcon where possible; the first layer initializes Phalcon’s routing, which handles requests and delivers them to the controller based on its url. User content is generated using Volt templates, which are picked by the controller. Because Phalcon’s default Models function with (relational) databases and we are using XML data, our model implementation is custom. But wherever possible we use components from Phalcon (for example, validation is handled using Phalcon’s classes). For a detailed description on the routing principles used in OPNsense, visit Frontend Routing. Not all parts of the framework are already implemented, but by deriving all controllers from the base in the OPNsense project it’s easy to extend and adapt to future needs. Documentation on how to implement controllers, with the use of views, can be found at Using controllers and views. All models are defined by a combination of a class and an XML containing a (nested) definition. More information on defining models can be found at the frontend model page Creating Models. Communication to the backend service is handled via a unix domain socket.